It's officially October and the last month of summer is over. 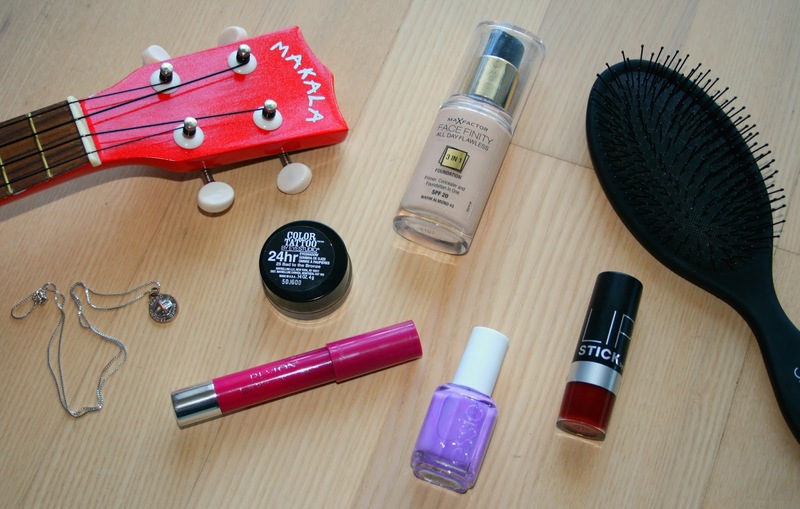 I'm going to share with you the items I have been loving during the month of September. I used to use this a lot as an eyeshadow base and then I kinda forgot about it. This month I was looking through my makeup collection and I found it and fell in love with it again. Now I use it alone all over my eyelids, as an eyeshadow. It's an easy way to create an everyday natural smokey eye look, that will stay on your lids all day. It takes no time and blends out easily with a brush, then a few coats of mascara and you are done! Since we have just entered fall or Autumn as some might call it, we are definitely going to start seeing dark lip colors everywhere. This one from H&M is perfect if you want to try out the fall trend, without spending a lot of money. This dark redish-plum color is highly pigmented and easy to apply. You can even dust some powder over your lips and make this color matte, that way it stays on way longer too. It's one of those lip colors that will make your teeth look whiter, because it's more cool toned. Warm toned lipstick like orangy-reds, can make your teeth look more yellow. I recently got this product, so it might be cheating adding this in my September favorites, but I'm going to do it anyway. After wearing this for a full day, I knew this was going to be my new favorite foundation. As it says on the packaging it's a primer, concealer and foundation in one and I couldn't agree more. It's amazing! Medium to full coverage, blend nicely, gives a satin to matte finish on the skin. It's great for my normal to oily skin. Really recommend you trying this. If you are in the states, it's the same as the CoverGirl 3 in 1 Foundation. Max Factor and CoverGirl are twin brands, same product, different packaging. This was the last summer nail polish I was able to enjoy, before fall took over. This is a bright, almost neon purple color. It's super eye catching and fresh looking. You need about 2-3 coat to get an opaque color and it looks very smooth and almost gel-like on the nails. I have been enjoying applying this lightly to my lips. I just dap on a little bit and smooth it out with my finger and then you have a bright matte-ish lip color. It's beautiful with a natural eye look and it stays on for a long time. If you apply it heavily you get a shiny/glossy, mid-toned pink bright color and when it slowly wears off, it leaves your lips stained with this beautiful pink color. I have had this guy for over a year now (almost two) and I wear it every single day. I only really take it off when I'm working out, so it has definitely been worth the money. I'm so sad that it's starting to wear down. You can probably see on the closeup above that it's starting to look more copper than silver. I'm still going to wear it though, it's just so simple and right up my alley. Don't remember if I have mentioned this brush before, if not, now is the time. This brush is the most amazing brush I have ever tried! It takes me no time to brush my hair out, because this brush doesn't tug on your hair, it glides through your tangles with ease. I even got my mom hooked on it! Lastly my new MEGA favorite, my first ukulele! I have been wanting to learn how to play an instrument for the longest time and I thought a ukulele would be a good start. I was not prepared for blisters though, so that's not so much a favorite, but other than that, I really enjoy it, it's fun and I'm excited for when I'm able to play a complete song. That's it from me today, I hope you enjoyed it. Watch out for my next blog post, if you want to know how you can make your own lashes look like false lashes, just by using mascara!